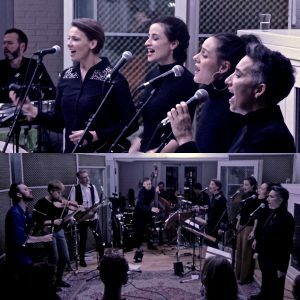 About Tone of Voice Orchestra is a brand new, ebullient and colorful powerhouse of a band. TOVO features musicians fromthe Danish folk-, world-, jazz-, impro- and indiepop-scene. 4 singers, violin, hurdy-gurdy, bagpipes, shawm, saxophones, 2 drummers and Swedish harp bass. 5 women and 5 men. With this unorthodox line-up we mix the sound of Scandinavian roots with impro and catchy songwriting sung by multiple voices in a northern Scandinavian song tradition. In December 2018 we met up for a live streamed studio concert to test out new material on a cyberspace audience. We are: Ania Rybacka, Maria Kynne, Tine Refsgaard og Trinelise Væring, – vocals, Emma Kragh-Elmøe – violin, Mads Kjøller -Henningsens – hurdy-gurdy, bagpibes, shawm and flute, Fredrik Lundin – saxes and bass flute, Joel Illerhag – Swedish harp bass, Jesper Uno Kofoed and Anders Provis – drums and percussion. The songs are written by my long time musical collaborator and award winning Jazz saxophonist Fredrik Lundin and myself singer-songwriter Trinelise Væring. 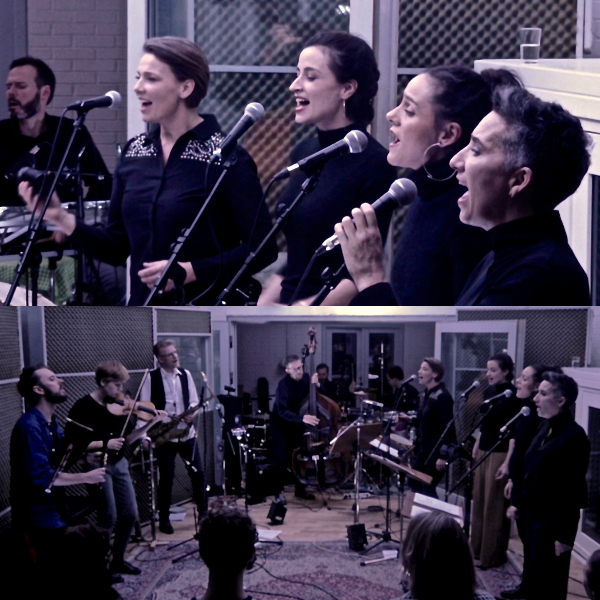 All of the 5 women and 5 men in the band are sought after artists in their own right, performers from different musical arenas and known from such popular bands as Spöket i köket, Basko, Floating Sofa Quartet, Trolska Polska, Elmøe og Hoffmann, Iki, Myrkr, The Glas Vocal Ensemble, Visible Voices, the Artof Escapism, Rybacka/Stefan Pasborg, Offpiste Gurus, Trinelise Væring Band, 5Go Adventuring Again, Marylin Mazur Group, Maluba, Hess is More, and many more. All these different musical voices meet in a common language of its own.